I have long said that celebrating Mass, and for that matter, all the sacraments, is a believing person’s activity. It is essential that those who celebrate the Eucharist believe in what they are doing. That may be simply stated. Sometimes the simple truth eludes us. The grounding of our participation in the Mass is faith in what Jesus came to earth to do. Jesus sacrificed his life to God the Father on the cross. That was a historic moment which revealed the deeper mystery of the relationship of the Father and Son. The Son eternally gives himself to the Father and the Father eternally receives and gives life back to his Son. This exchange of love is animated by the Holy Spirit. Jesus came not only to reveal this truth to us but to invite us to share in that exchange of love who is God. Jesus gave us baptism that we might receive the Holy Spirit. He gave us confirmation to strength that Holy Spirit within us. Then, Jesus gave us the Eucharist as the means whereby we come to share the very life of God. At the Last Supper he gave us this ritual and told us to “do this …” We remember Jesus’ sacrificial death AND we join in that sacrifice. As we enter the sacrifice of Jesus to God the Father, we receive back through, with and in Jesus, his life. We are united to God by sharing in the body and blood of Jesus. We receive his life into our life, and we are transformed by this heavenly food. In short, as the bishop often says, at Mass we truly encounter Jesus. This is essential and first. Too often, we become consumed with the form and the matter of the celebration. We focus on the signs and symbols. Are they done well, and right? Do I like them or not? Is it beautiful, and theologically accurate? How long did it take and why are people participating or not participating in the way they should? I am guilty of asking all these questions. Sometimes we (I) make of supreme importance what we like and do not like. Please don’t misunderstand. The form and matter of the celebration of the Mass are important. We should not make Mass ordinary and mundane. The beauty and the gloriousness of the Mass really do make a difference. Yet if we do not believe in the deep mystery we are participating in, all the external expressions of this mystery we are entering into, no matter how well they are executed, will not make a difference. Catholics have walked away from the most glorious and mysterious of liturgies as easily as they have from the folksy and sloppy liturgies not because they were one way or the other. Rather it was because they did not believe. Likewise, Catholic have through the centuries stayed in the pews because underneath the form and matter however it was dressed up or stripped down, they believed that being there and participating in this action of Christ really lead them to encounter Jesus and brought them into the heart of divine love. When we believe what happens in the Mass, we will strive to the best of our ability to celebrate this holy moment with all due reverence and enthusiastic participation and it will transform us. However, when we truly believe, how Mass is celebrated will be important, but it will not distract us from the essence of its reality. “Therefore, go and make disciples of all nations, baptizing them in the name of the Father and of the Son and of the Holy Spirit, and teaching them to obey everything I have commanded you” (Mt 28:19-20). 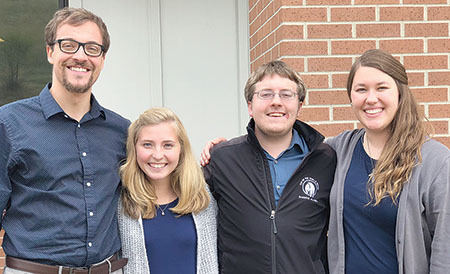 Acosta, Sarah Knopik, Kim Herdering, and Andrew Noah will be helping the students at Black Hills State University, Spearfish, find that authentic friendship with Jesus as missionaries from the Fellowship of Catholic University Students. FOCUS is a Catholic outreach organization whose mission is to share the Gospel with university students. Missionaries are trained in church teaching, prayer, Scripture, evangelization and discipleship, inviting students to have a personal relationship with Jesus, and accompanying them along the way. BHSU is one of 19 new FOCUS campuses this academic year. They are working from the new Newman Center which was dedicated in September. One of the first things the missionaries do on campus is begin leading Bible studies. Then, eventually, begin training students to organize and lead their own. The goal is to bring students closer to Christ and to help students establish and/or deepen their relationship with Christ. All four missionaries first experienced FOCUS through a Bible study. As an undergraduate at North Dakota State University, Knopik became involved with a FOCUS Bible study her freshman year. From there she was invited into discipleship (one-on-one mentoring program) with another student. First year missionary Andrew Noah, joined a Bible study his freshman year at St. John University, Collegeville, Minn. By his sophomore year he was leading a men’s group in his dorm. After attending a leadership conference, he began to think about becoming a missionary. It was through a Bible study that Kim Herdering, a first-year missionary who also attended North Dakota State University, was invited to attend a SEEK conference. At that yearly national conference — presented by FOCUS — she encountered the Lord in a new way and carried that through her college experience. Majoring in biology, with the intent to continue on with a career in medicine, she always felt called to care and serve people. Ben Acosta was leading a Bible study on his own, not knowing that the University of Northern Colorado had a Newman Center. “I went to a pro-life event and met a FOCUS missionary and was plugged into and started doing things with the Catholics on campus,” he said. All four are excited about the new Newman Center and being part of an expansion campus. The group attended Mass at both St. Paul Church, Belle Fourche, and St. Joseph Parish, Spearfish, when they first arrived in S.D. and have been welcomed by parishioners at both parishes. At the heart of the celebration of the Mass is the kerygma. Say what? Kerygma? Kerygma is a Greek word that means proclamation or preaching. It was the word used in the early Christian times to describe the first message of the fledgling community. Jesus, who suffered and died, rose again! It was the core teaching of the new church and remains so for us today. As such, it is at the heart of the celebration of the Mass. Okay, better back up. Father John Riccardo, who is coming to lead us in the Summit next fall, takes the proclamation of the kerygma seriously. He teaches that there are four points to consider. First, God created the world and all that is in it. God created you and me and God did so out of pure love. There was no need for God to do this. God simply loves, and his love is manifested in the creation of the whole world, including and especially human beings. We gather at Mass as his loved creatures. Second, we sinned. The story of the fall reveals the great loss of God’s love. It reveals the reality of evil in our world, and Lucifer who is the king of this world. Lucifer and the fallen angels lost paradise in their rebellion. His only purpose in life is to steal from God what God loves more than anything. Lucifer seeks to steal us from God by tempting us to doubt God’s love. At Mass we are reminded of this in the Penitential Rite and the Lamb of God. The third aspect of the kerygma is Jesus. God sent his Son to become one with us. Jesus came to wage war against Lucifer and his kingdom of death. Jesus was more than a moral teacher, more than a nice guy. He was the one who put on the armor of God’s love and went out to defeat the strong man and steal his possessions. Jesus came to fight for us. He did that by entering the very realm of the devil, death itself. He rose victorious and promised us that we would, too. The evil one cannot win if we are attached to Jesus. We thank God for his Son and his victory in the Eucharistic Prayer. The fourth part of the kerygma is our response. What are you going to do in light of the proclamation of this good news? At Mass we are invited to “go forth …” The answer to that question is to have faith and to trust in God’s eternal and merciful love. The answer is the celebration of the Mass itself. We come up alongside Jesus, we put on the armor of his Spirit and we offer ourselves with Jesus to God the Father knowing — knowing — that we will triumph. Like I said, at the heart of the celebration of the Mass is the kerygma. Do you believe that we encounter Jesus in the celebration of the Mass? That might seem to be a strange question from the Director of Liturgy for the diocese. Well … yes, but I think the depth of our belief needs to be explored. We believe that Jesus is truly and really present in the Communion we receive. It could be argued that this is the reason we come. I would not disagree. However, much happens in Mass before Communion and it is not unimportant. We are, throughout the Mass, encountering Jesus in the Word proclaimed, the priest presiding and in the community, gathered. The presence of Jesus throughout the Mass does not diminish the importance of Communion. Catholics have a unique awareness of the reality of the Lord’s presence in the sacred species, and that reality has drawn many Catholic into a deeper union with the Lord, has brought non-practicing Catholics back to their faith practice and has been a significant dimension of conversion for others. Still, if Mass were simply a matter of receiving Communion, we could simplify things quite a bit. The presence of Jesus in the Communion we receive is grounded on our belief that Jesus, risen from the dead, is present all the time. Jesus is alive and active in our lives. The resurrection was not simply a historically significant event that we remember with fondness. It is a living reality he makes present to us today. Jesus continues his saving work in, with and through his church in the world today. Our belief in the real presence of Jesus in the Eucharistic species is predicated on this deeper reality. The risen Jesus continues to bring about the salvation of the world. As Jesus did once in history, so he eternally offers himself to God the Father in sacrifice, to free us from our sins and to bring us into union with God. At the heart of the celebration of the Mass is our desire and willingness to join our sacrifice to the sacrifice of Jesus. My coming to Mass and my participation in the whole celebration are how I concretely offer myself with Jesus to God the Father. The listening, the praying, the attention, the singing, all my gestures and actions, all in celebration of the Mass are how I join the sacrifice of Jesus. Joining my sacrifice to the sacrifice of Jesus is not possible unless I am with him, that is, encountering Jesus. The whole of the Mass is giving expression to our desire to enter this encounter with Jesus. We believe that by making this sacrifice with Jesus to the Father, we will also share in the resurrected life God gives to his Son. Communion is the gift of God the Father to us. It is the deep encounter with Jesus we have been preparing for throughout the celebration of the Mass. The fact that Jesus is present to us throughout the Mass is the underpinning that makes communion so powerful. When we embrace our belief that the risen Lord is present and active in our lives all the time, then the celebration of the whole Mass and our immersion in the celebration with our whole heart, mind and soul, are essential. It is through the whole Mass that we encounter Jesus, and in that encounter, receive the great gift of his life in our life through holy Communion. So, the question is important. Do you believe that we encounter Jesus in the celebration of the Mass? Fr. Adam Hofer is a parochial vicar at Blessed Sacrament Church, Rapid City, and Deacon Zane Pekron is a Theology IV student at St. Paul Seminary in St. Paul, Minnesota. Totus Tuus has been a great blessing for our diocese in building and promoting a culture of vocations, and it has borne much fruit — not only in the number of priestly and religious vocations, but simply by helping our young people to seek a living and personal relationship with the Lord. As we begin to celebrate the 25th anniversary of Totus Tuus, I asked Father Tim Hoag, founder of the camp as we know it, to share a bit of the history of this remarkable gift. Fr. Tim: Totus Tuus Vocations Camps developed mostly through trial and error. Bishop Steven Biegler and I, while we were in seminary, recognized a need to develop a community of young men who were interested in priesthood. We held our first vocations camp in 1989 at Camp Rimrock. Fifty-six middle school boys and girls attended. It was a great retreat. However, we took a four-year hiatus as both of us went off to theology school. The summer of my diaconate year I sought permission from and the support of Fr. Arnie Kari, who was the vocation director at the time, to put on a vocations retreat. He gave us his blessing. Bishop Steven Biegler and Father Peter Kovarik, who were newly ordained, other diocesan seminarians and I put on a retreat at St. Martin Monastery. It was a weekend retreat (Friday through Sunday) and was offered for high school and college-aged men. Father Tony Grossenburg attended this retreat and has shared that it was instrumental in his decision to go to the seminary the following year. We learned from this retreat that the age spread of high school through college was too big, plus we thought a camp atmosphere would work much better than a retreat format. Also, the research provided by the National Conference of Diocesan Vocation Directors highlighted that the first time a young boy begins to think about being a priest is in his middle school years. So, we decided to start with middle school boys with the hope of building the camp by later adding high school boys and young men as leaders. From 1996 – 2011 it was held at various Protestant camps throughout the Hills because, at the time, we did not have our own retreat center. Camp was held at Camp Rimrock, the Wesleyan Camp, Atlantic Mountain Ranch and Camp Bob Marshall. Eventually, we settled on a permanent place in the schedule at Storm Mountain Camp. In 2012, we moved to our diocesan retreat center at Terra Sancta Retreat Center in Rapid City. In those early years we had to prepare our meals and snacks for the camp. These were largely put together through volunteers from the cathedral parish where I was assigned as an associate pastor. When the first sixth grade group had attended Totus Tuus for three years and were moving into high school we realized we needed to have a leadership camp to continue to build a community for these young men who were interested in seminary. We developed the high school leadership camp which was held two days prior to the middle school camp. Alongside diocesan seminarians, the boys from the leadership camp helped run the middle school camp. When Father Brian Christensen became vocation director in 2002, we realized there was a need to encourage young girls to consider religious life. Thus, we developed Totus Tuus Girls. Father Brian and I really did not know how to put a camp like this together. Therefore, we turned to the Council of Major Superiors of Women Religious to find young women religious who were willing to assist us. Not knowing any better, we set the schedule for the first girls camp exactly as we had run the boys’ camp. About a half a day into the first camp, the sisters who had come to assist us met with Father Brian and me to revise the schedule. They wanted to add things we would never have dreamed of adding with boys. For instance, they suggested an hour of preparation time to get ready for breakfast and an hour for lunch, allowing the girls to have time to visit. They also wanted to give the girls time for crafts. We would never have included crafts with the boys. Putting things like sharp objects (scissors), glue and the like into the hands of the boys didn’t seem wise. In time, the sisters, in coordination with the vocations office, were designing the schedule and the talks for the girls’ camp During this time, the first fruit of Totus Tuus was received. Father Grossenburg, who attended that first retreat, was ordained. Under the direction of Father Brian and Susan Safford, at that time a newly consecrated virgin, as well as Father Kevin Achbach who succeeded Father Brian as vocations director, the camp’s numbers increased. We also began to see more fruit from the camps. Men who had attended the camp as middle school and high school boys were beginning to be ordained including Father Tyler Dennis, Father Jonathan Dillon and Father John Paul Trask. We have also seen the fruit of the girls’ camp with Rachel Wilhelmi (Sister Familiae) and Giovanna Julian (Sister Poveri) with the Servants of the Lord and the Virgin of Matará, and Audrey Blankartz (Sister Lucia Christi) with the Nashville Dominicans. 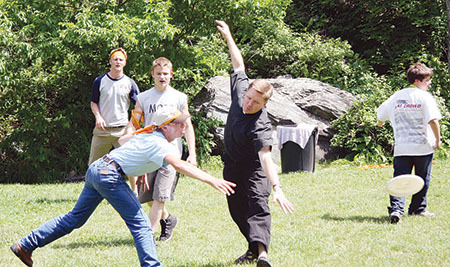 We also have three seminarians who were Totus Tuus campers: Deacon Zane Pekron, Andrew Sullivan and Robert Kinyon. This trend continues under vocation director Father Mark McCormick. Last year, the camps served 95 middle school and 38 high school young people. Fr. Mark: If you or your children have any stories to share about the blessings of Totus Tuus in their lives, I would love to hear them. We can see the fruits of those who have chosen priesthood or religious life and have shared with us the impact Totus Tuus had on their decision, but it is harder for us to see how the camps have assisted young people in general to draw closer to the Lord and to listen to his call.